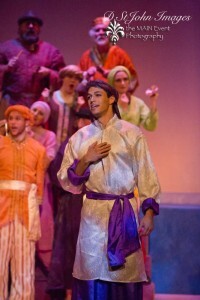 “Kismet” provides some of most rewarding melodies in recent memory! 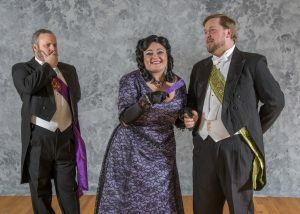 The Loveland Opera Theatre has enjoyed audience enthusiasm while presenting such productions as “The Mikado,” “HMS Pinafore,” and “La Boheme” in past seasons. 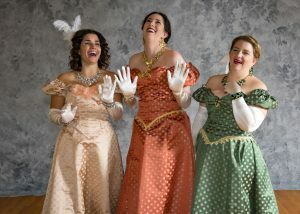 Juliana Bishop Hoch and her artistic team took a risk by presenting “Kismet,” an amazing, but less familiar show! Prior to the opening curtain, when welcoming the audience to the Rialto, Dr. Hoch noted that the show has rarely been seen in Colorado, with the last production provided several years ago by the CU Boulder School of Music! The rarity of productions is our our loss. I first became acquainted with the music when it opened on Broadway, winning the Tony Award as best musical in 1954 and ran for more than a year starring Doretta Morrow and Richard Kiley. It transferred to London where it ran for 648 performances. I bought the original record then and have found two subsequent concert CD versions of the show. An MGM movie was released in 1955 starring Howard Keel, Ann Blythe, and Vic Damone. 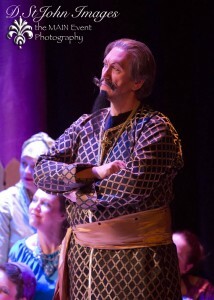 The show has music and lyrics by Robert Wright and George Forest, with melodies derived from Alexander Borodin’s collection of works including “Prince Igor.”” The story is based on a 1911 play by Edward Knoblock. 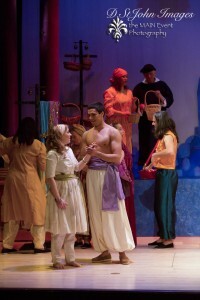 I first saw the show as an excellent London revival many years ago. .
On the stage of the Rialto, the Loveland Opera Theatre production begins on the streets of ancient Baghdad, where beggars plead with the locals for enough coins to feed their families! Some beggars have staked out claims to specific areas of the marketplace, with the most desired place occupied by Hajj. A poet turns up, finding that Hajj is out of town and immediately sets up shop to beg and to hopefully sell his rhymes. Benjamin Wood is terrific as the Poet. His voice is excellent, as he sings and tells of his abilities to not only create rhymes but to cast and reverse spells (cast by others), as needed. He is accompanied by his beautiful daughter, Marsinah! Lindsey French is a terrific “find” portraying Marsinah. She has the moves of a ballet dancer, and a voice that is as clear as rare crystal! The Poet’s timing in occupying the beggars place is unfortunate, as he is mistakenly thought to be the real Hajj, is kidnapped and taken to the desert dwelling of the leading criminal in all Mesopotamia, “Jawan”’ It appears that the original Hajj put a curse on Jawan many years ago, and Jawan is eager to have the curse reversed. The Poet displays his effectiveness with words, and convinces the evil Jawan that he can reverse the curse put on him, and return his son to him – all for an amazingly sum of coins. The romp continues as The Poet is delighted to share his wealth with anyone of interest, and sends his daughter Marsinah to look at a palace to buy! Marsinah is looking in the garden of a prospective palace and finds The Caliph, who she believes to be the local shirtless gardener. He is actually trapped by his staff to look through a group of women to select a bride. Senhica Klee is excellent as the wealthy Caliph. When French and Klee combine their voices in “Stranger in Paradise,” the chemistry is seductively enchanting! This is one of the finest scenes in Northern Colorado in recent memory! The road to love is not easy, and all manner of interventions appear, with everything eventually working out so that the young lovers can be united! In the interim, the incredible music continues! The cast is large and includes great performances by Boni McIntyre as Lalume, Rob Hoch as Wazir, Trevor Valdez as Omar, Bryan Grosbach as Chief of Police and Greg Fischer as Jawan. Costuming is good. Lighting is impressive. Set is nice, although a bit cumbersome in moving features to create various locations. 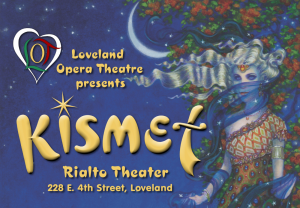 “Kismet” in Loveland is directed by Timothy Kennedy, Conducted by Nicholas Gilmore, with Choreography by Sarah Wilhelm, and Scenic and Lighting Design by Peter F. Muller. Don Reidy is credited as Master Carpenter. 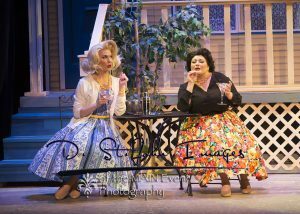 There are over 150 costumes in the show, with 80% of them designed and hand stitched by Davis Sibley and his team of three other costumers. 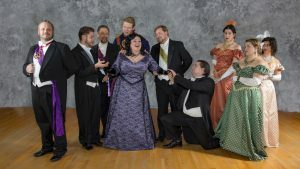 My wife and I saw the Loveland production with a few friends who noted they had substantial difficulty in understanding what was being said and sung especially in the first act. This is unfortunate, as the lyrics are delightful! 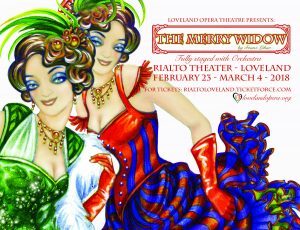 This is a major production, and kudos must be given to Dr. Hoch and the entire team of the Loveland Opera Theatre for providing such a remarkable show! The voices are outstanding. And no, I still can’t get the melodies out of my mind!